A beautiful landscape and productive garden start with the soil beneath your feet. Find out what, if anything, you need to add to your garden soil to grow healthier plants. Test the soil when starting a new garden or one that’s struggling. And check on your garden maintenance by testing the soil in existing gardens every 4 to 5 years. 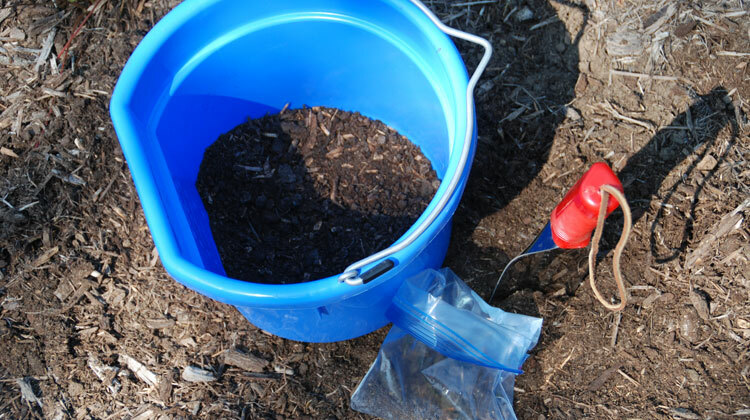 Use a trowel and clean bucket to gather a soil sample. Slide away mulch if needed and remove a slice of soil 4 to 6 inches deep. Take several samples from the garden or lawn area you want to test. Collect samples from each edge and several throughout the middle of the bed. Mix them together, place about a cup in a plastic bag and send to your University or State Certified soil testing lab. You can take a soil test anytime the ground is not frozen and you haven’t recently fertilized. A bit more information: Wait for the soil to be moist not wet before working in the recommended fertilizer and amendments. Working wet soil can result in cracking and clods that last all season long. Cultivating overly dry soil can also ruin the soil structure.